My mother, grandmothers, and aunts are talented ladies. Just by seeing a design, they can weave, knit, crochet, or embroidery. I have seen absolutely stunning designs that they have made. 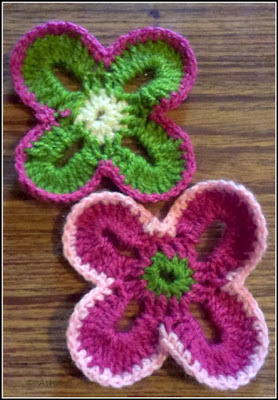 When my aunt showed me a crochet piece that belonged to my great grandmother, I was astonished. The work is neat and beautiful. Makes me imagine that my great grandmother was not only creative but also a lovely lady. They are very beautiful. You can join so many of them and make a shawl. Thanks, Indrani. That was the initial plan but I now use them each as coasters.